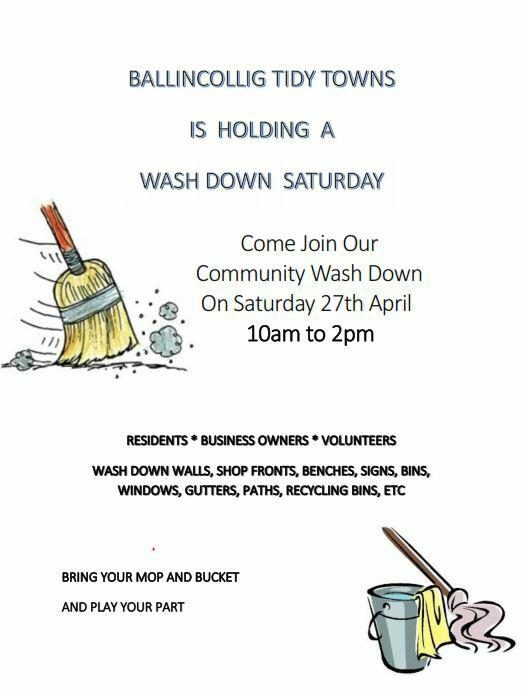 Ballincollig Tidy Towns is looking for all Businesses, Schools, Clubs, Groups, Shops and Residents to support the ‘Wash Down Saturday’ drive on Saturday 27th April from 10am to 2pm. This is about a community coming together to make our town the best it can be. Businesses and shops come out and wash down your premises, walls, signs, gutters, railings and windows. Residents come out as a group and wash down walls, signs, bins, poles, railings, gates and benches in your estate. Schools, clubs, groups organise some teams to wash down walls, windows, signs, railings, gates and paths in the front of your own building. Volunteers will be needed to come out and wash down poles, bins, benches, gates, railings, flower boxes etc. throughout the Main Street. We will arrange a meeting point in order to allocate specific items and areas to small groups. Your support will ensure the success of this event. We appreciate your ongoing support and hope that this will benefit us all.